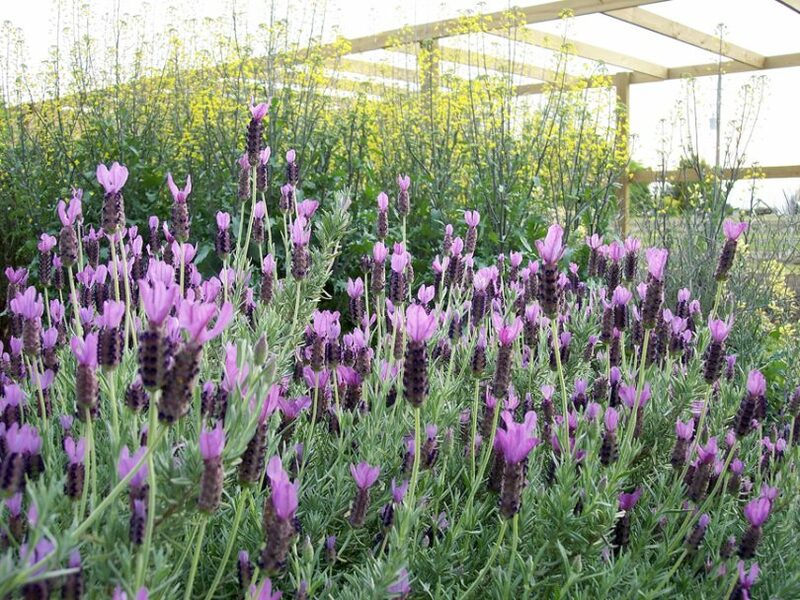 What’s evergreen, disease-resistant, drought-tolerant, sometimes edible (though not by deer), easy to propagate, pollinator-friendly, and adaptable to different uses in the landscape? If you knew to guess herbal shrubs, you’re probably already familiar with these plants’ many charms. Botanically, an herb is any plant that does not produce a woody stem. But culturally, the definition of an herb is much broader and can include plants grown and used for culinary or medicinal purposes. 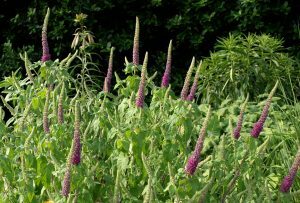 Often fast-growing, resilient, and requiring little from the gardener in terms of pest or disease management, an herb may be a good substitute for a more problematic woody plant you’re currently growing. Many of these plants grow to heights of less than 5 feet or can be easily kept at a desired height. And though they have been used for centuries to treat a variety of ailments, never take any plant internally without first consulting a medical professional. Bay laurel (Laurus nobilis) is an evergreen shrub or small tree native to the Mediterranean. Its leaves are commonly used to flavor soups and stews, and it is also the plant from which the ancient Greeks and Romans made wreaths and crowns for their cultural and military heroes. Hardy in Zones 7b-11, bay laurel is best grown in containers in the Piedmont, so that it can be brought indoors in winter. It takes pruning well and can be trained as topiary if desired, although it looks equally elegant if left to its natural shape. Germander (Teucrium chamaedrys) is an evergreen perennial that performs well as an edging plant or very low hedge. Grown in full sun and sharply drained soil, it requires little water once established. Its small, glossy, dark green leaves make it an attractive substitute for boxwoods. It flowers in late summer into the fall in colors from rose-pink to purple. Although once used in medicinal applications, it is now considered toxic and should not be ingested. Oregano (Origanum vulgare), marjoram (Origanum majorana), thyme (Thymus vulgaris), and winter savory (Satureja montana) don’t need to be relegated to our spice racks. These plants all grow very well in central North Carolina and can be used in a variety of applications, as edging plants, groundcovers, container plants, or small specimens in the border. All require full sun and well-drained soil. Mulch them annually with compost and cut them back aggressively, to 6 inches tall, in late winter or early spring. Take cuttings liberally throughout the summer to use in cooking. 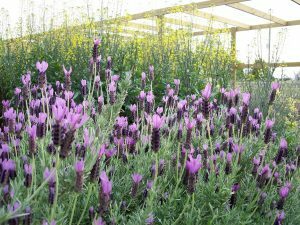 Lavender (Lavandula sp.) is another semi-woody plant that can be managed like oregano and thyme. It struggles more with our humidity than the other common culinary herbs do, but mulching with gravel can help. Cut it back in late winter and thin bushy plants to increase airflow. Rosemary (Rosmarinus officinalis) can grow to become a substantial semi-woody plant in our area. Seldom bothered by deer, it takes pruning very well and can be used to create medium-sized hedges in full sun. It’s an unusual alternative for giving winter structure in the garden, and its tiny blue flowers are beloved by bees. 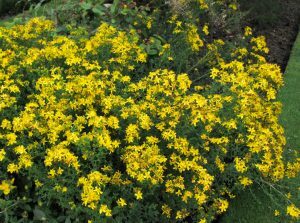 Hypericum perforatum, also known as St. John’s wort, is a broad-leafed evergreen perennial growing up to 2 feet tall. It performs best in full sun but will grow in partial shade. Its yellow flowers in early summer are followed by colorful berries. The plant grows rapidly via underground runners and can be invasive in some circumstances. Pull out any unwanted plants when they are small. Cutting the berries for use in floral arrangements and wreaths can also curb the plants’ spread. This plant is used to treat depression, anxiety, and insomnia but should only be used under the advice of a doctor. Looking for something for a shadier, damper site? Sorrel (Rumex acetosa) is a leafy perennial herb with broad, lemon-flavored leaves rich in vitamin C. Evergreen in central North Carolina, it is less shrubby in habit than many other herbs, and could be used in place of small hostas. Like hostas, sorrel can be susceptible to slugs and snails but tends to suffer less than many ornamentals. It can be grown from seed but is also easily propagated by division.